Before string theory, there was Einstein’s relativity, and before that was Newton’s gravity, and for about two centuries before Newton, the laws governing the universe were believed, by most of the Western world, to be those set out by Aristotle. Understanding the later revolutions in cosmology starts with the original models of the universe developed by the ancient Greeks. Aristotle pictured a universe that was made of a substance called the aether. The heavens, to him and his followers, were a place of unsurpassed geometric elegance and beauty that didn’t change over time. In some ways, Aristotle is seen as one of the first scientists. He spent a great deal of time discussing the importance of observation to understand nature. Aristotle described the universe as containing five fundamental elements: earth, air, fire, water, and aether. The heavens were the realm of aether, but we were stuck down with the earth, air, fire, and water. Aristotle knew Earth was a sphere, and he thought that each element had a natural location within that sphere, as shown in this figure. The natural location of the earth element was at the center of the sphere — this was considered the earth realm. Next came the water realm, followed by the air, fire, and finally aether realms. The moon resided somewhere on the border of the aether realm, probably right on the edge of the fire realm. The clouds — composed of air and water elements — drifted in the air, along the border of the air and water realms. You can mix water and earth to make mud, but the earth part tends to eventually settle on the bottom because the earth realm is beneath the water realm. When a fire was ignited, the flames reached up into the sky in an effort to reach the fire realm, where the sun resided. 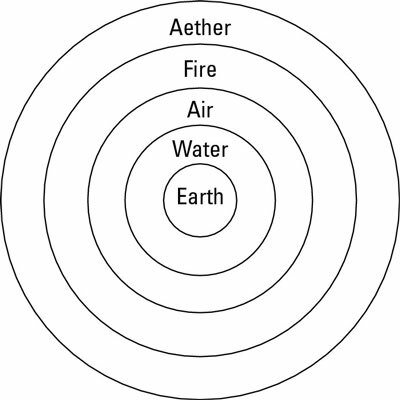 In Aristotle’s model, the outermost sphere was the aether realm, relatively untouched by the mundane elements, aside from the moon (hardly mundane) and its border with the fire realm. It was a perfect realm, which contained the stars, fixed in place on a serene, eternal background. This belief defined the heavens for well over a thousand years. The cosmological model of the stars’ movements built on Aristotle’s philosophy was called the Ptolemaic model, after the man who invented it. Ptolemy lived in Roman Egypt during the second century AD, doing his principle work in the city of Alexandria. His book on astronomy, the Almagest (which roughly translates to “the greatest”) was written in approximately 150 AD. The greatest achievement of this volume was to attempt to describe the motion of the heavens in precise mathematical language. The model described by Ptolemy, and maintained by most scholars until the time of Copernicus and Galileo, was a geosynchronous model of the heavens, in which Earth was at the center of the universe. The reason for such a model is obvious from Aristotle’s elemental spheres depicted in the figure: Earth has a distinct, unique place in the universe. In Ptolemy’s geosynchronous model, the moon, planets, and sun are mounted on rotating spheres around Earth. Beyond the planets is the largest sphere, which has the stars mounted on it. This model accurately predicted the motion of the planets, so it was well received.